Feel free to use any of the palettes in these images, or invent your own 4 color monochrome ramp! Also, Game Boy Advance games would violate both the resolution and color requirements, to say nothing of the optional strict GB rules! That is to say, This activity is about Game Boy style games, not GBA (despite my many typos in the original draft of this activity!). Actually you are very unclear. This is about de-making a recent game. If it's a recent Mario game, that's fine, but you should probably avoid franchises that have already existed on the GB since (barring cleverness) ... where's the point in that. I just wanted to see how it would look. I don't consider myself a pixel artist - as is apparent from the above piece (mostly a re-coloring), I couldn't pixel to save my life - but this thread inspired the curiosity I mentioned and I thought I'd share the result. @ Helm - I was keeping my thumbs up for Flashback Of course, that would hardly be next-gen.
@ CroM - I would be willing to inflict a bodily harm upon myself to play a four color "metroidvania" Bioshock. Originally started to be elebits-ish, but the result is a little strayed. I might try another, cuz that was fun. WIP C+C Welcomed and Needed. My first pixelation attempt, just had time for the menu at the bottom tonight, and a small bit of the course, so it lacks detail. Ill try to get it a little detailed tommorrow. (Its Hot Shots Golf by the way). 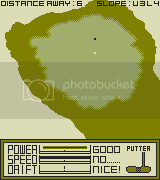 I've got a few problems I can point out but can't fix, like the power bar doesn't seem to be very user friendly (in viewing, not in game), the Golf Selection Text (Putter), not being very readable, and it just kind of looks boring altogether. Mabey once I get the actual screenshot done it will look better? Allright, will post updates as available, and will try to use all criticism. And mabey I should explain the mechanics, as they're a bit different from the actual Ps2/3 versions. The top bar sets power, middle sets speed of swing, and bottom sets control. You want to hit either in the middle (perfect, demonstrated in bottom), or near the edge but not to close (Ok, demonstrated in top), and hitting within three pixels of the edge results in a horrible shot (demonstrated in middle). Appropriate messages will display. Thats about it. not entirely happy with how it turned out. @ Radek: Another World NEVER is a waste of time . I thought about demaking Heart of Darkness. and yes, the Bioshock demake would have to be a "metroidvania" style game, allthough I think topdown zelda like would do it more justice(evading, and more environmental possibilities).